Recovery crews attend to a Russian Soyuz TMA-01M spacecraft (bell-shape at right) after it landed on the snowy, windy steppes of Kazakhstan in Central Asia on March 16, 2011. The Soyuz returned NASA astronaut Scott Kelly and Russian cosmonauts Oleg Skripochka and Alexander Kaleri to Earth after 159 days in space. This story was updated at 4:48 a.m. ET. A Russian Soyuz spacecraft landed in Kazakhstan today (March 16), bringing a NASA astronaut and two Russian cosmonauts safely back to Earth after a months-long stay at the International Space Station. The Soyuz TMA-01M capsule touched down in Kazakhstan about 50 miles (80 kilometers) north of the town of Arkalyk on the snowy steppes of Central Asia at about 3:54 a.m. EDT (0754 GMT), though it was just before 2 p.m. Local Time at their landing site. Onboard the Soyuz were the space station's Expedition 26 commander Scott Kelly of NASA and Russian flight engineers Oleg Skripochka and Alexander Kaleri. 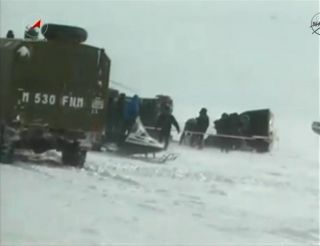 They landed under harsh conditions, with ankle-deep snow and 30-knot winds reported by recovery crews. "The Soyuz landed on its side, but in good shape," NASA spokesman Rob Navias said from the landing zone. The wind apparently dragged the spacecraft by its parachute about 75 feet (nearly 23 meters), Navias added. "You would think that it was a scene out of the North Pole," Navias said, calling it "viciously cold" at one point. "It was a bull's-eye landing under very harsh conditions." The Soyuz cosmonauts and astronaut appeared to be in good shape as recovery teams helped them out of the space capsule. The crew would be whisked into helicopters to begin the trip home in order to limit their exposure to the harsh winter cold, Navias said. "It is extremely cold and they don't want the crew to be exposed to these conditions for a long amount of time," Navias said. The crew of Russia's Soyuz TMA-01M space capsule is bundled up in blankets while readjusting to Earth's gravity after 159 days in space. The Soyuz landed March 16, 2011 carrying NASA astronaut Scott Kelly (right) and Russian cosmonauts Alexander Kaleri (center) and Oleg Skripochka back to Earth from the International Space Station. The returning trio of spaceflyers spent 159 days in space during their mission to the International Space Station. They left behind three other station crewmembers, who will now serve as the station's Expedition 27 crew. The Soyuz undocked from the station at 12:24 a.m. EDT (0424 GMT) as the two spacecraft flew 216 miles (347 km) above China. After two tests to check the vehicle's docking and landing systems, the Soyuz began the trip home. "Goodbye, U.S. segment of the space station," Kelly said as the Soyuz pulled away. "We shall meet again." Kelly is the twin brother of fellow NASA astronaut Mark Kelly, who is set to command the space shuttle Endeavour on its final mission to the space station next month. Mark Kelly is the husband of injured Arizona congresswoman Gabrielle Giffords, who is recovering after being shot in the head during a Jan. 8 attack in Tucson that injured 13 people and killed six others. Scott Kelly has said that he hopes to help his sister-in-law with her recovery when he returns home to Houston. With the successful landing, Kaleri entered the record books as the second most-flown in space human in history. The 159 days in space he spent with the Expedition 26 mission increased his total spaceflight time to 770 days over five spaceflights, placing him second behind Russian cosmonaut Sergei Krikalev (803 days over six spaceflights). The mission marked the third spaceflight for Kelly, who now has 180 days of spaceflight experience. It was the first space mission for Skripochka. The Soyuz TMA-01M carrying Kelly, Kaleri and Skripochka launched toward the space station in October and marked the first flight of the updated Soyuz space capsule design. During the crew's Expedition 26 mission, the space station saw the arrival of cargo ships from Japan, Europe and Russia. The crew also performed two spacewalks to upgrade the space station. Earlier this month, NASA's space shuttle Discovery also visited the space station during its final mission before being retired. The shuttle delivered a new storage room and a humanoid robot called Robonaut 2, which station astronauts will test for use on future spaceflights. Station astronauts unpacked Robonaut 2 yesterday before the Soyuz TMA-01M departed the orbiting laboratory. Kelly also turned command of the orbiting outpost over to cosmonaut Dmitry Kondratyev during a short ceremony before leaving the station. "It's been a great pleasure working with Expedition 26 here, and we're looking forward to working with Expedition 27," Kondratyev said at the change of command ceremony on Monday (March 14). "I'm sure we'll get everything done and see you soon." Kondratyev will remain on the station with NASA astronaut Catherine Coleman and European astronaut Paolo Nespoli. They are scheduled to return to Earth in May, but will first be joined by three new crewmembers due to launch on an upcoming Soyuz flight from the Baikonur Cosmodrome in Kazakhstan. That next Soyuz launch was slated to blast off on March 29 EDT, but has been delayed to no earlier than April due to technical issues. You can follow SPACE.com Staff Writer Denise Chow on Twitter @denisechow. SPACE.com for the latest in space science and exploration news on Twitter @Spacedotcom and on Facebook.